ANN LAMBERT was an Irish convict woman who was tried and convicted at the Lancaster Quarter Session on 20 July 1829 for the robbery of a warehouse and sentenced to fourteen years transportation per Roslin Castle (2) (1830). At the time of her conviction she was married with one child. She was assigned to masters and mistresses in various locations around New South Wales, including Sydney, Newcastle, Maitland and Dungog. No matter how far or how wide she roamed, though, she continually found herself back in the Parramatta Female Factory and on at least one of those occasions was committed to Newcastle Gaol and the attached Newcastle Female Factory (established 1828) with an unnamed child in tow. Well beyond her sentence of transportation, ANN LAMBERT frequently appeared in the gaol admissions books in Darlinghurst, New South Wales. Born: 1800–1802, Strabane, County Tyrone, Ireland. 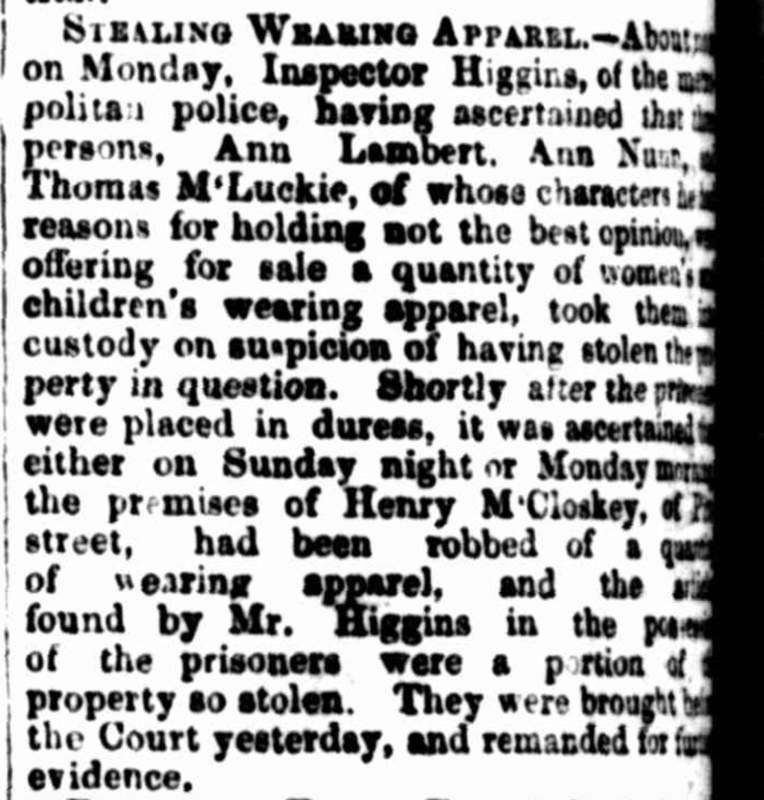 Tried and convicted for robbing a warehouse: 20 July 1829, Lancaster Quarter Sessions, Salford, England. Sentenced to fourteen years transportation. Arrived in the colony of New South Wales per Roslin Castle (2): 29 June 1830, Port Jackson, New South Wales. The Convict Indents state she was assigned to EDWARD SPARKE, King Street, Sydney, so it is very likely this occurred on arrival. 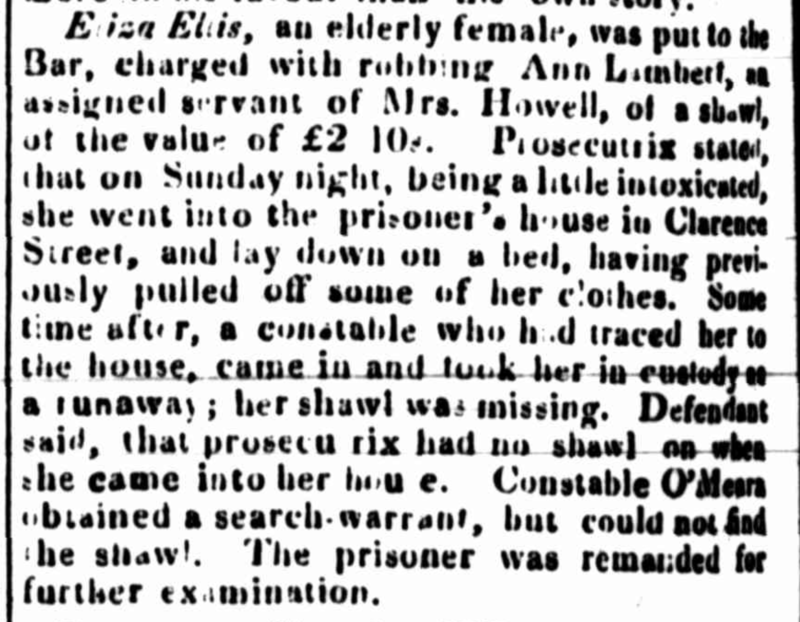 Took ELIZA ELLIS, “an elderly female,” to court, accusing her of stealing her shawl whilst ANN was in a state of intoxication in her house on the 4 May 1834: 10 May 1834. 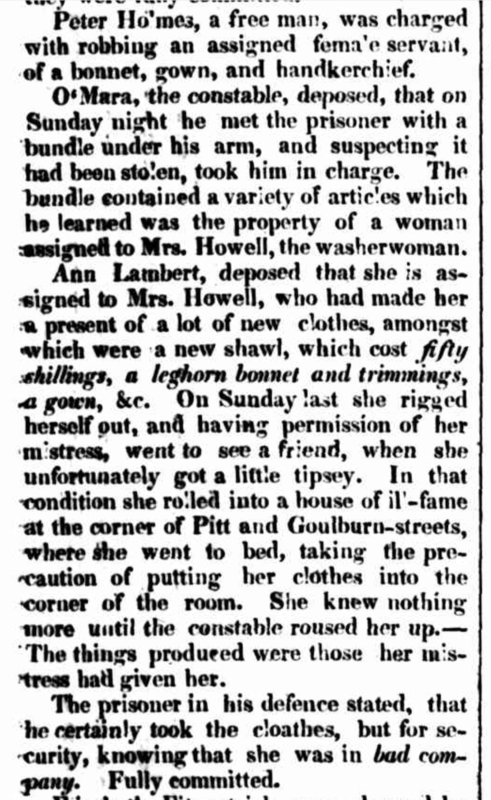 PETER HOLMES tried for stealing her shawl in ELIZA ELLIS’s house on the 4 May 1834: 21 July 1834, Sydney Quarter Sessions, Sydney, New South Wales [c.f. Law Report of ANN LAMBERT 24 July 1834 and Law Report of ANN LAMBERT 25 July 1834]. Female Factory Online (www.femalefactoryonline.org, 2018), 30 May 1833, Law Report of ANN LAMBERT, (p18330530). 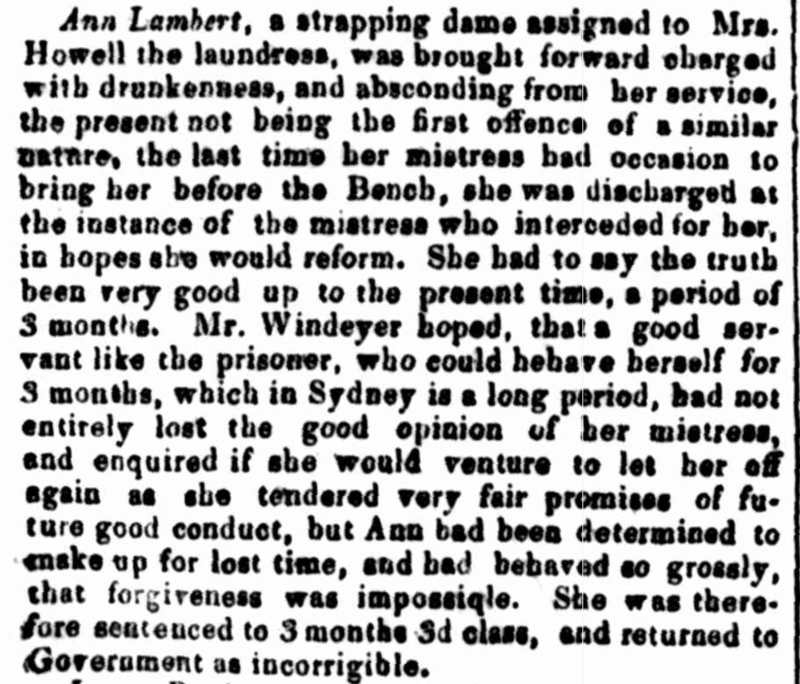 Female Factory Online (www.femalefactoryonline.org, 2018), 24 April 1834, Law Report of ANN LAMBERT, (p18340424). Female Factory Online (www.femalefactoryonline.org, 2018), 10 May 1834, Law Report of ELIZA ELLIS and ANN LAMBERT, (p18340510). Female Factory Online (www.femalefactoryonline.org, 2018), 17 October 1834, Law Report of ANN LAMBERT, (p18341017). “Police Office,” The Sydney Monitor (NSW : 1828 – 1838), Saturday 10 May 1834, p. 2. “LAW INTELLIGENCE. SYDNEY QUARTER SESSIONS, JULY 24, 1334,” The Sydney Herald (NSW : 1831 – 1842), Thursday 24 July 1834, p. 2. “Police Incidents,” The Australian (Sydney, NSW : 1824 – 1848), Friday 17 October 1834, p.3. 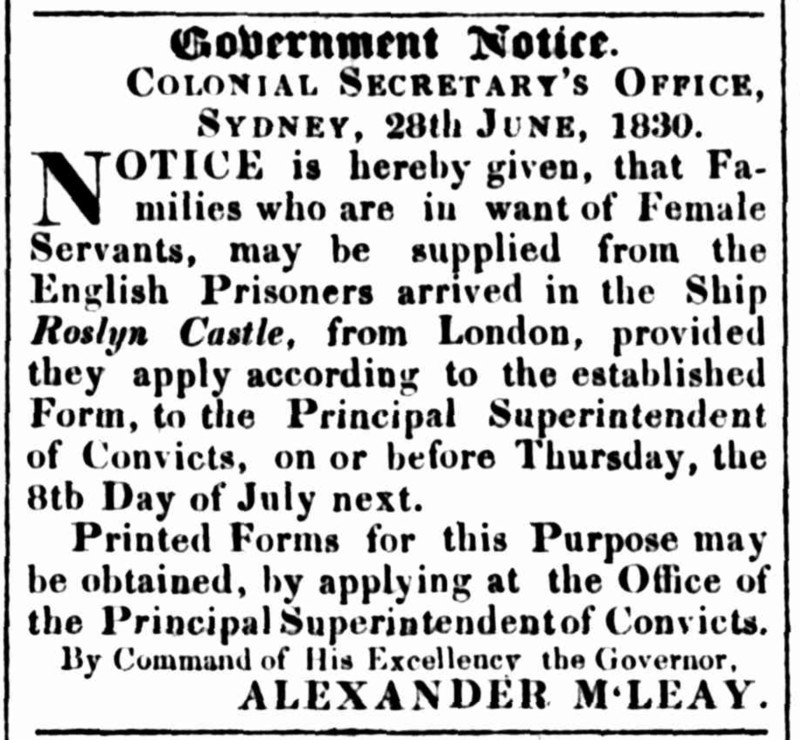 “Classified Advertising,” The Sydney Gazette and New South Wales Advertiser (NSW : 1803 – 1842), Thursday 1 July 1830, p. 1. “POLICE INCIDENTS,” The Sydney Herald (NSW : 1831 – 1842), Thursday 8 May 1834, p.3. 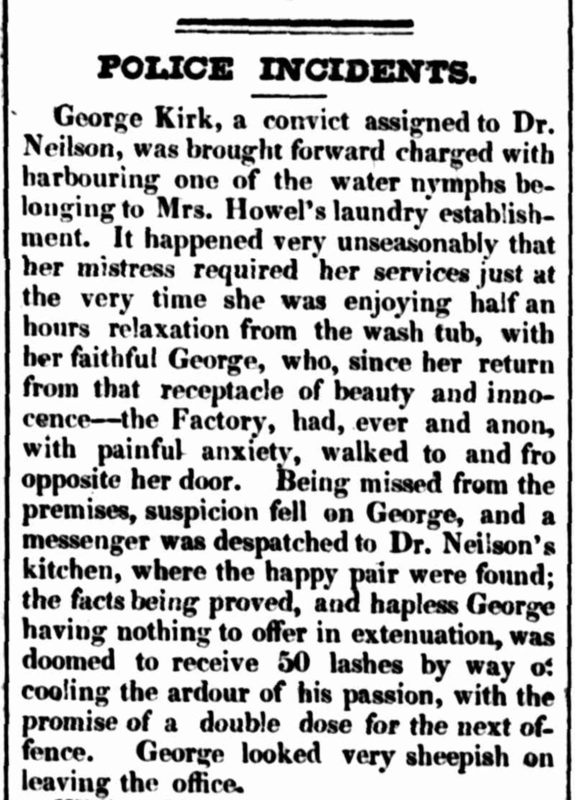 “Domestic Intelligence,” The Sydney Monitor (NSW : 1828 – 1838), Wednesday 14 July 1830, p. 2. 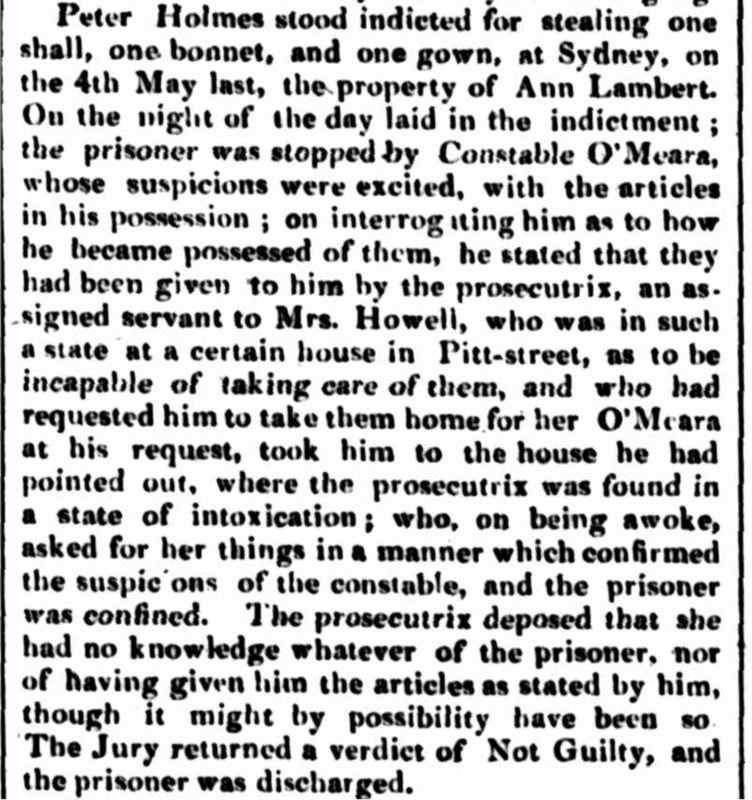 “Police Report,” The Sydney Gazette and New South Wales Advertiser (NSW : 1803 – 1842), Thursday 30 May 1833, p. 3. “SYDNEY QUARTER SESSIONS. THURSDAY,” The Sydney Morning Herald (NSW : 1842 – 1954), Monday 12 August 1850, p. 2. “No title,” The Sydney Gazette and New South Wales Advertiser (NSW : 1803 – 1842), Thursday 8 July 1830, p. 3. “No title,” The Sydney Morning Herald (NSW : 1842 – 1954), Wednesday 31 July 1850, p. 2. “Quarter Sessions,” The Australian (Sydney, NSW : 1824 – 1848), Friday 25 July 1834, p. 3. “POLICE INCIDENTS,” The Sydney Herald (NSW : 1831 – 1842), Thursday 24 April 1834, p. 2. Home Office, Criminal Registers, Middlesex and Home Office: Criminal Registers, England and Wales, Series HO 27, Piece: 37, Page: 424, (The National Archives of the UK (TNA), Kew, Surrey, England). Irish Convicts to New South Wales, 1788–1849 (http://members.pcug.org.au/~ppmay/cgi-bin/irish/irish.cgi, 2011), ANN LAMBERT, accessed 14 October 2018. New South Wales Government, Bound manuscript indents, 1788–1842, NRS 12188, Item: [4/4015], Microfiche: 675, (State Records Authority of New South Wales, Kingswood, New South Wales, Australia). New South Wales Government, Butts of Certificates of Freedom, NRS 1165, 1166, 1167, 12208, 12210, Reels 601, 602, 604, 982-1027, (State Records Authority of New South Wales, Kingswood, New South Wales). New South Wales Government, Description books [Sydney Gaol and Darlinghurst Gaol], NRS 2523, Reel 858, (State Records Authority of New South Wales. Kingswood, New South Wales, Australia). New South Wales Government, Description books [Sydney Gaol]. NRS 2517, Reels 855, 856, (State Records Authority of New South Wales, Kingswood, New South Wales, Australia). New South Wales Government, Entrance books [Sydney Gaol], Series 2514, Reel 851, (State Records Authority of New South Wales, Kingswood, New South Wales, Australia). New South Wales Government, Quarter Sessions: Sydney: Register of cases, 1846-1853, Series Number: NRS 847, Reel: 2432, (State Records Authority of New South Wales; Kingswood, New South Wales, Australia). New South Wales Government, Registers of convicts’ applications to marry, Series 12212, (State Records Authority of New South Wales, Kingswood, New South Wales, Australia). New South Wales Government, Tickets of Leave, 1810–1875, Series: NRS 12202; Item: [4/4169], (State Records Authority of New South Wales, Kingswood, New South Wales). Old Bailey Proceedings Online (www.oldbaileyonline.org, version 8.0), 14 February 1821, trial of THOMAS PIKE, THOMAS DOVE, WILLIAM COOPER alias HOMAN and CATHERINE JOHNSON alias HOMAN (t18210214-115), accessed 15 October 2018. The Digital Panopticon (https://www.digitalpanopticon.org/, version 1.1), William Cooper Life Archive (ID: obpt18210214-115-defend1195), accessed 15 October 2018. “Police Incidents,” The Australian (Sydney, NSW : 1824 – 1848), Friday 17 October 1834, p. 2. “Shipping Intelligence. ARRIVALS,” The Sydney Gazette and New South Wales Advertiser (NSW : 1803 – 1842), Thursday 1 July 1830, p. 2. “LAW INTELLIGENCE. SYDNEY QUARTER SESSIONS, JULY 21, 1834,” The Sydney Herald (NSW : 1831 – 1842), Thursday 24 July 1834, p. 2. William C. Watt, Journal of Female Convict Ship of the Line Roslin Castle, William C. Watt M.D. Surgeon, between the 12th day of December 1829 and 15th day of July 1830, Admiralty and predecessors: Medical Journals (ADM 101, 804 bundles and volumes). Records of Medical and Prisoner of War Departments. Records of the Admiralty, Naval Forces, Royal Marines, Coastguard, and related bodies. (The National Archives. Kew, Richmond, Surrey).